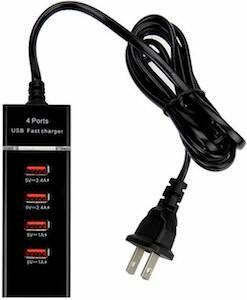 If you like to charge a lot of USB devices then you have to check out this 4 port USB fast charger. The charger comes in black or white and has 4 USB ports and just plugs into a power socket in your home or office. The USB charger has USB lights to show the ports status. The charger is 6.8A offering 2 2.4A ports and two 1A ports so that you can charge everything quickly and easily because now you only are using 1 power port and that can make things look a little bit neater. 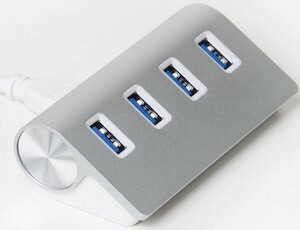 Come and check out this 4 Port USB Fast Charger. 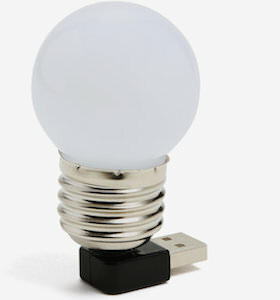 If you want some light for when you work on your computer in the dark then you should check out this USB light bulb. The light looks like a regular lightbulb and on the bottom it has a USB connector on a 90 degree angel so that you can stick it into the USB port of you laptop and you would have light. But lets not be limited by computers as you could use this lightbulb with a wall charger too so that you have light in a dark corner or you can use it in a power bank so that you have some emergency light at home or have light in your tent when you go camping . There is now an end to the dark thanks to this USB Lightbulb. If you want a fun USB drive for Christmas then check out this Christmas glove USB flash drive. 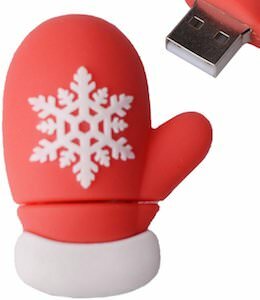 The flash drive looks like a red glove with a snowflake on it and it is a 16GB flash drive giving it plenty of space for Christmas movies, music and pictures. A drive like this can be ready for the next Christmas holiday to come and it is also a great thumb drive as a present for friends with on it many files from you and your family you like to share. So now you can get your family a year of your life on a USB drive. Come get your fun Christmas Glove USB Flash Drive. 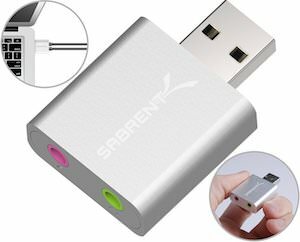 Nowadays many laptops do not have a port for headphones/speaker or a microphone anymore but this USB adapter from Sabrent offers both ports for your computer. And even if your computer has a problem with the audio adapter then you are in luck as this adapter has its own adapter build in so that you can have audio again. The USB adapter comes in black and silver so that you can make it match with your laptop and will work on both MAC and PC without the need of any drivers. Now you can use a real microphone and speakers again after you ordered this Sabrent USB Speaker And Microphone Adapter. If you are old like me then you know about those 5.25 floppy disks that could hold like 360kb of data now we have USB and on this t-shirt both will come together. You can see a big 5.25 floppy on the shirt with a cable connected to it with a USB connector on the end. Sure it’s not likely any one would make this or if it would even work but for a t-shirt it’s pretty fun and nerdy. And this geeky t-shirt come in styles for men and women and it comes in many fun colors to so that you can get the t-shirt you like with some fun and nerdy graphics on it. 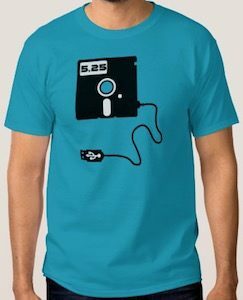 Come check out this 5.25 Floppy Disk With USB T-Shirt. USB C maybe the newest and coolest port for laptops but what are you gone use in it? Luckily the people from Sandisk make our life a lot easier as they now have a dual connector USB flash drive. The 32GB flash drive has a normal USB 3.0 connector on one side but the other side has a USB C connector and there even is a cover that will cover one of the two connector that you are not using. 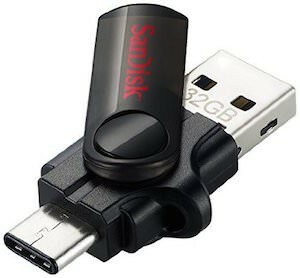 Just take you data from your old to your new computer as this flash drive make it so much easier. No need for converters just come get your Sandisk USB C And USB 3.0 Flash Drive. We all know those USB fan’s that have the flexible neck and are great to get some cool breeze going on at those hot days in summer. Now you can get this fan that is similar to that fan but this one also projects a message, it looks like the message is hanging in the air making it fun to look at. You can program the message on a Windows PC and you can program 8 messages of up to 26 characters each. And the fun thing of the fan is that it will remember the message so you can give it to friends and they will see your message. This fan has blue LED’s to display the message. If you want a fan for those hot days then why not one like this USB Fan With Programmable Message. With USB C quickly becoming the new standard for laptops we all have problems connecting our old devices like flash drives. But now there is this simple converter cable that convert USB C to USB A so that you can use all your old USB devices. The USB C connecter is a male so that it will fit in your Macbook or your Pixel 2 and the USB A is female so that you can use all your normal devices on it. 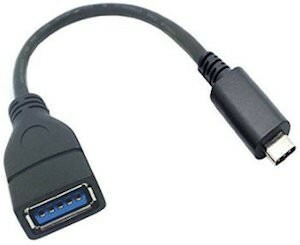 And at a fraction of the cost of the brand name wires you can be ready for your new computer with the smaller and better USB connector. So don’t wait any longer just come get your USB C male To USB A female Converter Cable. 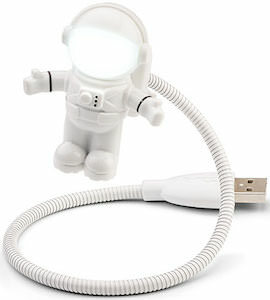 This is an astronaut usb light and it’s so cute that I want one for my laptop. The astronaut is connected to a 11″ long adjustable wire that connects to a USB port and when you open the astronauts visor then light will go on and you will be able to see in the dark. 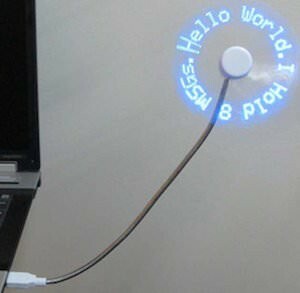 You can use this astronaut light with a USB port of your computer or through an external adapter. Now a space cowboy can be part of your home when you get your own Astronaut USB Light.